The holiday season is nearing an end. Christmas is over and the new year is coming. If you’re working on your to-do list and list of resolutions, consider some things that you might have been putting off, like your roof. It’s an important thing; the roof over your head needs to be strong through the years, and if it’s not, repairs could be expensive. Consider a new roof for a new year. If you haven’t seen any obvious issues on your roof, you might think that you don’t need any roofing services. But, roof problems aren’t always immediately visible. So, start the year with a roof inspection. A roofer will inspect all of your roof, including shingles, gutters, sealing, the attic, and more. An inspection has to be very thorough; your roof is more than the shingles. Your roof is an entire system. Cracks, mold, excess moisture, and other things aren’t always visible without a professional eye. Start your year with a roof inspection and be prepared for the rest of the year. If something is found when your roof is inspected, have it repaired immediately, or as soon as possible. You don’t want to start the year with roof damage. Even if the problems aren’t severe, they could become so if they’re left to sit. If you are concerned about affording repairs, talk to your roofers about temporary solutions while you find a way to afford repairs. If your roof is simply too old and has too many problems, then start a new year with a new roof so that you’re ready for the rest of the year. If you need an entirely new roof, or you need only small repairs, our roofing contractors can help. Call us at 903-691-0931 for roofing specialists in Texas, Arkansas, Louisiana, and Oklahoma. Posted in Uncategorized on December 29, 2017 at 5:06 pm by R.B.T. Construction Roofing Division. Ice dams don’t look like threats; they may even look pretty in winter. They are the walls of ice that appear on the edge of your roof. They occur because melting ice and snow on the roof move downward, only to freeze when they reach the roof’s edge. However, they can cause roof damage. It’s best to prevent ice dams on your roof this winter, and here are some tips to help you do that. The best way to prevent dams is to prepare your roof for winter. Begin by cleaning your gutters. This will help prevent the moist leaves from building up, freezing, and creating a barrier against water that is trying to move off your roof. Follow Tips for Preventing Ice Dams on Your Roof. Then, make sure that your attic is properly ventilated. If it remains cool and ventilated, it is less likely to cause excess water runoff that builds into an ice dam. When you insulate your attic floor, that helps to reduce the heat that rises from inside your home and into your attic. If your home has snow or ice on it, do what you can to clean it off as soon as you’re able. If you need extra help cleaning your roof, call a professional. Even moist leaves gathering during the fall can create the potential for ice dams, so clean those off, too. 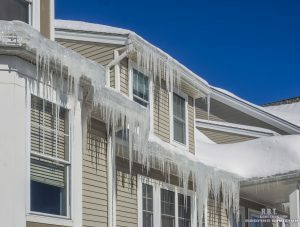 For more information on preventing ice dams on your roof in winter, or when you need roofing services of any kind in Texas, call our roofing specialists at 903-691-0931 today. Posted in Uncategorized and tagged ice dams, roof care on November 27, 2017 at 5:25 pm by R.B.T. Construction Roofing Division. Awareness of a Few Common Problems Can Greatly Extend the Life of Your Flat Roof. A flat roof represents an excellent choice for a commercial structure. 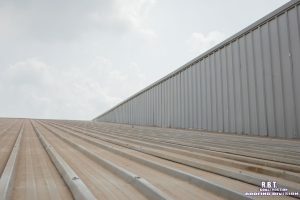 Not only do they save an immense amount of money as compared to peaked roofs, flat roofs benefit from an impressive array of roofing materials specially designed for the needs of businesses. Of course, to receive the highest return on your flat roof investment, you must remain aware of common issues. 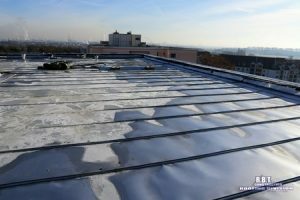 Pay attention to the following flat roof problems, and call for commercial roof maintenance if and when they appear. One of the most common problems with flat roofs, ponding water can cause serious damage. As the ponds persist, they can weaken the seams on your flat roof and encourage moisture problems and leaks. Roof ponding can have a variety of causes, including clogged drains and improper sloping. Before you have the ponds drained, determine the cause to prevent future occurrences. Bubbles or blisters appear on flat roofs due to the entrapment of moisture. Erosion of your roof can occur through sun damage, or just general wear and tear. Not all of these issues deserve immediate repair. Ideally, you can trust the opinion of a preferred roofing contractor to know when blisters and erosion warrant repair or restoration. These problems occur most often due to foot traffic. Punctures and tears in your flat roof membrane need immediate attention, as they allow for the passage of water. You can help control their development if you limit access to the roof, or create dedicated walkways. At R.B.T. Construction Roofing Division, we solve flat roof problems in Texarkana, TX. For an inspection and general consultation on the state of your roof, give us a call today at 903-691-0931. Posted in Uncategorized on October 20, 2017 at 1:47 pm by R.B.T. Construction Roofing Division. If you’re looking for a quality roofing material to install on your flat commercial roof, built up roofing is always a great choice. Roofers have been installing these roofing systems for over 100 years, and they have stood the test of time as a strong durable roofing system. R.B.T Construction Roofing Division offers repair and installation of built up roofing. Give us a call at 903-691-0931 to schedule your appointment today. Why Choose Built Up Roofing? Heat is Used to Install or Repair a Built Up Roof. Built up roofing offers excellent protection for you building and offers many benefits that make it a great roofing material. Unlike many other flat roofing systems, built up roofing doesn’t require any ballasts or fasteners. Installation for a built up roof involves applying heat, which melts the roofing material to the roof. 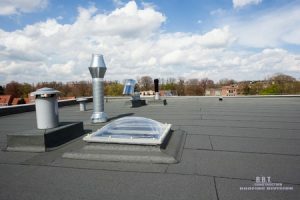 Built up roof systems have a glass fiber reinforcement, which is unique among flat roofing systems. This reinforcement layer provides the system with durability and makes the system last for a very long time. If you are interested in installing built-up roofing on your flat roof, give us a call at 903-691-0931. We are here to answer your questions and complete the installation. Posted in Uncategorized on September 13, 2018 at 10:21 am by R.B.T. Construction Roofing Division. Are you worried about roof coatings disrupting your commercial business operation? Don’t be. Roof coatings can be applied without closures of the building. That’s right, your operation can continue to function during the coating process. Not only are roof coatings cost effective in general, but the amount of money saved from maintaining business operation is extremely valuable. Roof coatings extend the lifespan of your commercial roof. Not only that, but they can be re-coated every decade to maximize performance. The materials used in roof coatings are renewable, and therefore project as a sustainable investment moving forward. Texarkana residents understand the heat of Texas summers. UV rays from the sun can begin to penetrate commercial roofing structures, causing degradation and performance loss. Roof coatings add a layer of protection against these harmful sun rays which becomes a major factor during the summer months. Commercial buildings are often exposed to the elements. 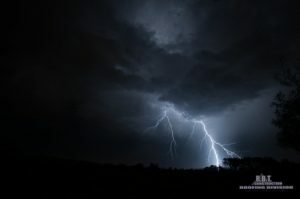 Thunderstroms, heavy winds, tornadoes, and even hail storms, can all affect properties in the Texarkana area. These storms can cause serious damage to your roofing structures. Luckily, roof coatings can help prevent damage from occurring during these storms, specifically the infiltration of water and moisture into your building. Call 903-691-0931 for roof coating installation in Texarkana, TX. Posted in Uncategorized on August 18, 2017 at 4:40 pm by R.B.T. Construction Roofing Division. In the warm months of summer, small damages to your roof can become big problems for you. To help avert this crisis, make sure you are completing proper Summer maintenance and repair to your roofing system. These simple steps can not only keep your roof working longer, but it can save you money on serious roof repairs. First, check all seams and seals for separation from walls, vents, or other fixed areas. Separated seams or seals with caulk can be a recipe for leaking and sun damage. Check the entire surface for age spots that could look thinned or faded. These spots have compromised protection against the weather, the sun, and other elements, and should be repaired as soon as possible. Inspect your roof for any signs of moisture. This could be from standing water, running water, or even condensation build up. Water in your roofing system is a precursor to disaster. Any water should be promptly removed, and any damaged areas should be repaired and resealed. Lastly, take notice of your roof’s general condition. Check for rips, wear and tear, and any issue that could cause weakening of your system. 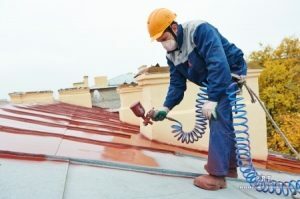 Roof coatings are a fairly inexpensive way to protect your roof from the outside elements and can be applied easily during your Summer inspection. These coatings protect against weather, rot, mold, UV rays, and even water. Contact RBT Construction at (903) 691-0931 for more information on your Summer roof maintenance schedule or to find out how a protective roof coating can actually save you money. Posted in Uncategorized on July 17, 2017 at 4:51 pm by R.B.T. Construction Roofing Division. If you are a business owner, you likely have a commercial flat roof to worry about! 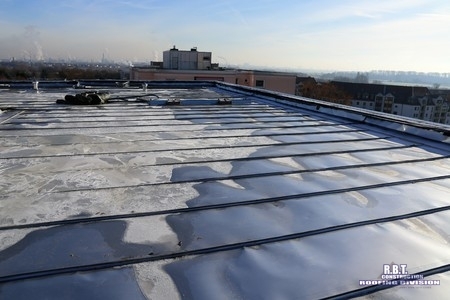 Most commercial buildings can be found with quality flat roof systems, but despite how common they are, this roof type can be susceptible to a variety of damages. In order to avoid major repairs or a shortened lifespan of your commercial roof, it is vital that you maintain your roof properly. Of course, maintenance can only help your roof if it was installed properly in the first place. A professional flat roof installation is the first step in maintaining a healthy roof. 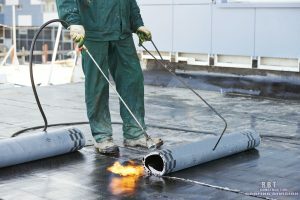 Your commercial flat roof requires special maintenance to keep it in top condition! For many commercial building owners, the aesthetics of the roof are a fairly low priority. However, the flat design of a commercial roof can leave it susceptible to gathering debris, such as leaves, dirt, and event trash! Buildup of these debris can cause mildew and mold to grow, and the moisture gathered in the debris can lead to rapid deterioration of your roof system. To prevent debris buildup, be sure to trim back trees around your roof, and check for buildup frequently. 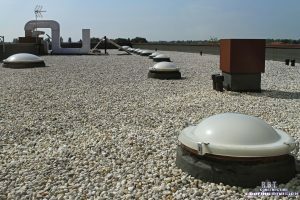 Many commercial building have roof access that you and your employees may enjoy. However, unless your roof is designed for foot traffic, such as a modified bitumen roof, you should avoid walking on your flat roof. Regular foot traffic on a roof that isn’t designed for foot traffic will quickly deteriorate your roofing material. If you need repairs to your commercial flat roof in Texarkana, TX, give us a call today at 903-691-0931! We can help you maintain or even replace your roof if needed! Posted in Uncategorized on June 15, 2017 at 2:35 pm by R.B.T. Construction Roofing Division. Because our commercial roofs provide shelter for our businesses, it’s important to have it in good condition. One of the things to ensure your roof is in peak condition is to have an annual roof inspection. While yearly inspections are encouraged, there are other times when you might need to have your roof inspected. With tornadoes, thunderstorms, and hail, it can do a lot of damage to your residential roof. It is important that after a nasty storm, you call a professional roofer immediately. While it might seem like your roof is fine from the ground, a roofer will be able to determine if there is any structural damage that needs to be fixed. Don’t wait until the problem becomes too severe to fix. 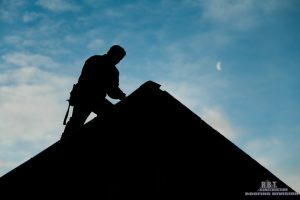 Whether you are selling your business or moving, it’s important to have a roof inspection. When you sell your business, you want to inspect the roof before you put it on the market, so you can fix problems before you sell the building. When you move into a new building, it’s important to have an inspection so you know what the condition of the roof is and if you need to invest in a new roof or just minimal repairs. These are important times to have your roof inspected so that you can save yourself money and stress. Are you interested in commercial roofing services for your building? Call the experts at R.B.T Construction today at 903-691-0931 for quality commercial roofing services. Posted in Uncategorized on May 12, 2017 at 5:05 pm by R.B.T. Construction Roofing Division. Tornadoes, high winds, hail and rain can do serious damage to your commercial roof system and even threaten collapse. Depending on the severity of the damage, your business may need to close until your roof can be fully repaired for the safety of your tenants or employees. If the damage is isolated, you may only need to close off a designated area. However, when your roof has suffered serious damage, a comprehensive inspection is critical to make sure that your building is sound and safe. If your area received heavy hail and high winds, but your roof looks unharmed, you should still have a professional contractor assess it. If there is any damage, you likely have a limited window of opportunity to file an insurance claim. In many cases, hail or wind can cause minor damage which will develop into major leaks and problems in the future months. By the time a serious problem comes up, it may be too late to file a claim, so inspect your roof right after a storm. Hail is an especially pesky problem that can cause unexpected trouble. Though your roof might appear unharmed after the storm, it could have unseen damage that can create serious issues down the road. This will cause it to wear faster, lose its protective coating, develop leaks and mold growth, and more. If surrounding homes, property, or other structures have sustained storm damage, it is wise to have your roof thoroughly inspected just in case. If you need commercial roof storm damage repair in Texarkana, TX, call RBT Construction Roofing Division at 903-691-0931 for quality repairs! We also provide storm damage repair throughout Texas, Louisiana, Arkansas, and Oklahoma. Posted in Uncategorized on April 11, 2017 at 6:16 pm by R.B.T. Construction Roofing Division. Help! My Flat Roof Has A Leak! You’re inspecting your commercial building when suddenly you see a puddle on the floor. After a bit of investigation, you realize the leak is coming from your roof! Roof leaks can happen for a number of reasons, including poor installation. Without the proper drainage, installation, and material, your roof can be more susceptible to damage and leaks than you may think. If you find your roof has a leak, the first thing to do is not panic. Schedule a repair with your local roofer for your commercial roof. If your roofer cannot come to complete the repair as quickly as you’d like, there are some more steps you can take while you wait. While some leaks may be smaller than others, all leaks can cause intense damage to your commercial property. This means that no matter how slow or small the leak is, you should deal with it once it comes to your attention. It is important to contact your local roofer as soon as you can and have the leak fixed quickly. Determine the location of the leak by accessing your roof. This can help you direct the roofer later. You can also take note of the cause of the leak, such as debris, damage, wear and more. With this information, your roofer can tell you how your roof needs to be repaired. Make sure any product, displays, or important materials are moved away from the site of the leak to prevent damage. This can save your property in the long run. You may also want to place a bucket to catch leaking water at this stage. With all assessment taken care of, photograph any damage you have taken from this incident. This will make it easier for insurance claims and damaged product within your property. Photographs will also be useful for your roofers later. Do you have a leak and need your commercial roof repaired? RBT Construction Roofing Division is available to assist you. Give us a call today at 903-691-0931. Posted in Uncategorized on September 13, 2018 at 10:25 am by R.B.T. Construction Roofing Division.